One day after the Ebola outbreak in West Africa was declared over, a new case was confirmed in Sierra Leone. Amelia Yeo, Restless Development’s Senior Partnerships Manager, was in Sierra Leone that day but tells us why what she saw gives her hope. I’ve been wanting to visit Sierra Leone for years. Colleagues and friends have spoken of regular electricity blackouts, overpowering heat, widespread poverty & badly maintained roads which make it near-on impossible to travel during the rains. But they’ve also shared photos of beautiful beaches, told of their commute to work on the back of an Okada (motorbike taxis) across Aberdeen bridge while eating a mango in the sun, the glory of rural landscapes, and – most important of all – of the Sierra Leoneans they’ve met and worked with who don’t hesitate to step in and lend a hand if they see you need one, and for whom “hospitality is our culture”. Since working for Restless Development, I’ve had the chance to work with our team here as they scaled up a youth-driven Ebola intervention that reached 54% of communities across all of Sierra Leone. Even before the Ebola crisis was declared a national state of emergency in Sierra Leone, Restless Development was using our unique peer education model to mobilise young people across the country in their communities and those of their neighbours; working with them to prevent the spread of the virus and engage community members in locally appropriate sustainable action. Behind the 3500 Restless Development alumni and young mobilisers who were ready and able to respond to the crisis is an incredible team, who I’ve seen work tirelessly in their mission to get to ‘zero + 42’ – the official number of days after which a country is declared clear of the virus by the World Health Organisation. On November 7th 2015, the Ebola outbreak in Sierra Leone was declared over. On 9th January, I stepped off the exhilarating speed-boat ride from the airport, excited to visit and participate in discussions with young people and Restless Development staff on what comes next, what are the priorities, and how young people can continue to play a central role in Sierra Leone’s long-term development. On 15th January, the day that West Africa was due to be officially declared as free of Ebola as Liberia reached 0+42, a new case of Ebola was found in Sierra Leone. The government announced it officially on the 16th, while I was visiting a project in Freetown’s Kolvart slum, situated on the edge of Freetown in the Western Urban District. The challenges faced by slum communities are significant. Walking through Kolvart I stepped over open sewers while small children played with chickens and followed the ‘stranger’ (me) for something different to do. People go about their day to day in the heat, buying small groceries from informal shops set up in front of houses, cooking on braziers, washing clothes, filling buckets of water at one small pump, stepping over rubbish with the smell of effluent heavy in the air over the open drainage ditches. The community has some electricity, but access to clean water is restricted to a few pumps, and there is one primary school and no health centre to meet the needs of its 40,000 residents. Recently, severe flooding in Freetown along with slum clearing as part of a government policy have exacerbated their problems, with particular dangers for displaced young girls and women. Hawanatu Koroma, a member of a REFLECT savings group run by Restless Development, displays products from her shop in Kolvart slum. 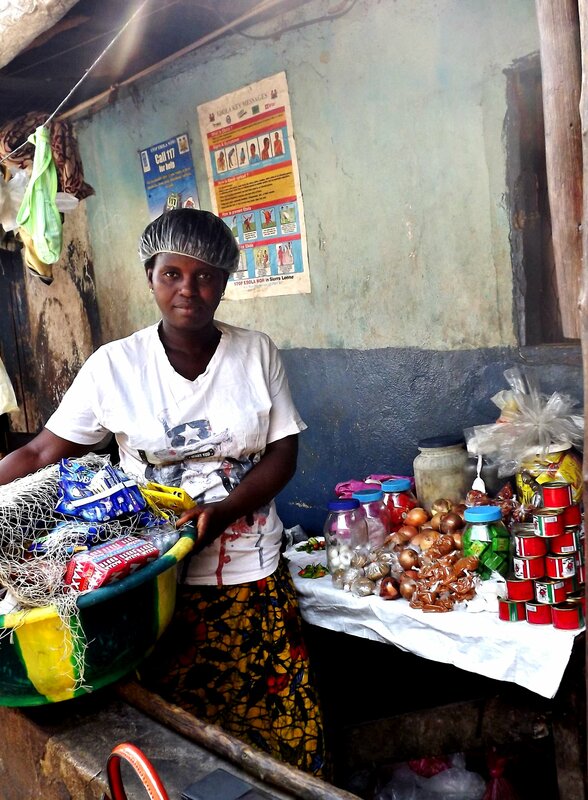 Hawanatu saved Le50,000 through the group, and was able to take a loan to start her business. Since 2014 she has paid back the loan, and is still saving now with the group, allowing her to contribute to her child’s education, and pay healthcare costs within the community. Our project, part of a wider 4 Cities Urban Slums initiative funded by Comic Relief, delivered alongside 4 other leading youth agencies and academic institutions, aims to improve employment options for some of Sierra Leone’s poorest women and girls. Savings groups are set up by women to become economically independent. Young facilitators provide training in literacy, numeracy & business skills and then work with community leaders, locally run civil society organisations (CSOs), and other young men and women to create safe spaces in which they can get information about sexual health, sanitation and hygiene, and sexual and gender based violence. During my visit I talked to the Circle Management Committee (the community leadership committee, made up of Elders, tribal Chiefs, and young representatives), to local organisations at the Ataya Base, and to a group of women taking part in a REFLECT savings circle and safe space – a group education session for women and girls. Everyone I met spoke of the impacts of the project. The local men’s chief said that rates of violence had fallen, but that women who did experience violence now had the confidence to report the local Family Support Unit for support and justice, and that young girls had been empowered by education to choose safe family planning methods that improved their healthcare. We sat down with members of local organisation ‘Women’s Wings’, in a small shelter packed with people, who told us how they had started house to house visits to educate men about domestic violence, drawing on support and information sharing from Restless Development’s facilitators. I met two members of savings groups who had succeeded in starting their own businesses. Both told me how they are now seen as role models for their peers because they can afford to pay school fees for their children, get treatment when they or their families are sick, and support others in their community. Despite these gains though, the same message was repeated again and again. When I asked those I met what their priorities were, and how they felt about the newly announced Ebola case, they didn’t speak about the return to Ebola prevention protocols, but focused on bigger needs, the long-term change needed to overcome the barriers they face on a daily basis: We need Education. We need free access to healthcare. We need continued engagement from organisations like Restless, whose young leaders are a part of these communities, supporting us to advocate for better services and gain the skills to improve our lives ourselves. Favour Abibatu Kamara, who joined Restless Development as a community facilitator for our Pull Slum Pan Pipul programme 3 years ago: “You educate the girl, you educate the nation”. 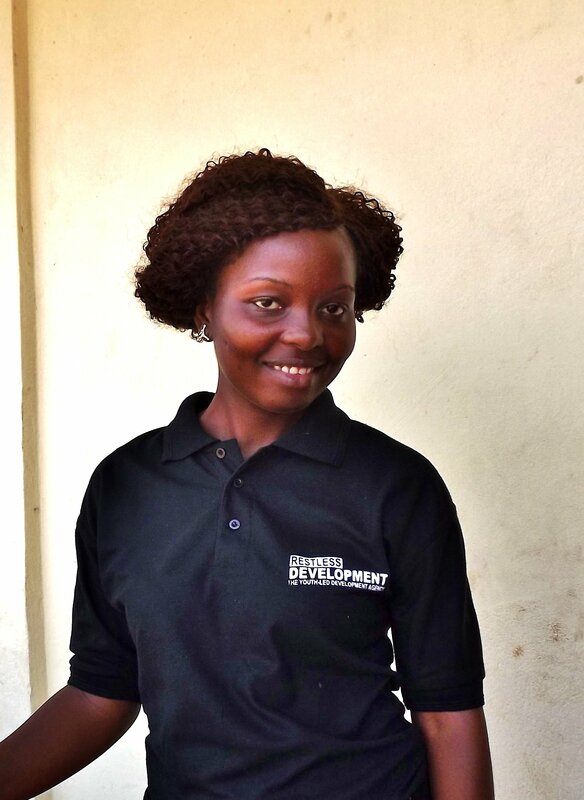 Restless Development’s Facilitator for this district, Favour Abibatu Kamara – aged just 25, had limited education herself before joining the project. She summarised it for me: “I was sitting, doing nothing, then I had the chance to join Restless. Now I can stand and talk to people. So many young Sierra Leoneans are unemployed. They lack the education to get jobs but have the potential to do so much. We have succeeded through this programme in getting them to listen, to focus their mind so that they can do something for themselves. We see many young men going out after talking to us and seeing how the girls are doing it. They are getting jobs – as Okada drivers or starting businesses for themselves. In schools, young girls are talking in class. They’re competing with the boys.” I asked her how she felt – having spent the last 18 months integrating Ebola prevention work into the existing project framework, did she feel disheartened by the new case? Her reply was simple – “We have continued talking about caution and prevention in the Western Area. As a volunteer you have to be ready for these things. You might face challenges, but you are always prepared”. I’m leaving Sierra Leone with the voices of this community in my mind. With the determination and ambition of my colleagues to bring together a stronger youth –led civil society, and the readiness of the young people we work with, these obstacles can be overcome. As my host Aruna told me, “os tite tae, fawl mos lay agg” – No matter the obstacle, you will find a way.